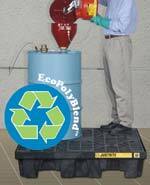 The new EcoPolyBlend™ Spill Pallets™ from Justrite Mfg. Co. is designed to keep spills under control and avoid slip accidents. Made of 100-percent recycled polyethylene, the pallet protects against groundwater contamination and uses 100-percent, post-industrial recycled material that might otherwise have been discarded into the waste stream.